Instantly capturing your heart, Sterling, a slight, gray, spotted dog, is in search of a home...a place to belong. He has twisted himself pretzelishly into shape after shape to try to fit in and be whatever someone wants him to be... so he can be loved. Somehow he neer succeeds. But this time, this time ladies and gentlemen, boys and girls, this time Sterling has a foolproof plan. He is going to arrive at his new home as a fork ... a truly much-needed implement no home can be without. Whimsy runs rampant here as Sterling contorts, twists, stretches, squeezes and to our amazement does take on the shape of other things. How can a dog appear to be a the cutest thing sticking out of the dishwasher utensil compartment? 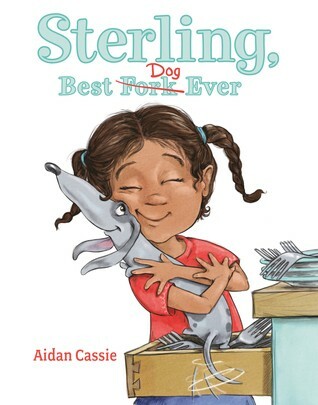 With a tug at our heartstrings and a tickle of our elbow's best compartment, Sterling learns such an important lesson that truth be told many adults are still working out for themselves. This book gives every child a headstart ... a veritable advantage. Read aloud to every young'un you know and love..... best thing in the world is to be yourself and discovered you are loved just as you are.